Exceptional Image Quality. The D800 offers a 51-point AF system, Nikon EXPEED 3 image processor, 3.2-inch rear LCD, and 91k-pixel metering sensor. It also features a 15.3MP DX mode, allowing high-quality images when you’re using DX lenses. Great for Sports Shooters. Sports shooters may find the 25MP 1.2x crop mode useful for giving just a little more distance to their telephoto lenses. The D800 is capable of 4 fps continuous shooting in FX mode and 6 fps continuous shooting in DX mode. Revised Controls. The button layout has gone through a slight restructuring, including the adoption of the D7000 AF mode/function control. The D800 has both CF and SDHC/XC memory card slots. Improved Video and Audio. Nikon has included the D4’s beefed-up video mode in the D800. It records 1080p at 24/30 fps in H.264/MPEG-4 format in-camera, or uncompressed 8-bit 4.2.2 footage via external recorder. The on-screen audio levels and headphone jack simplify monitoring with 20-step increments for adjusting audio levels in-camera. You can also manually adjust this camera’s exposure settings, including the 1/8th-stop power aperture mode, allowing extreme fine-tuning. The D800 allows simultaneous on-camera live view for situations that require external monitoring. Memory-card compatibility issue. We strongly recommend using Sandisk memory cards with this camera. Other manufacturers’ memory cards—particularly Kingston CF and SD cards—have known compatibility issues with the D800. Viewfinder-miscalibration issue. There have been reports of viewfinders being miscalibrated, resulting in backfocus when manually focusing through the viewfinder. We’ve tested all of our cameras and haven’t found any exhibiting this problem. Left-side autofocus-sensor issue. There are certainly plenty of reports from very reputable sources demonstrating that many D800 bodies have inaccurate left-side autofocus sensors. 1. Nikon has not recognized the problem or announced a correction. 2. The problem is somewhat inconsistent and subtle. 3. Many cameras sent to Nikon Factory Service with the problem come back just like they went in. Nikon has unfortunately decided “it is what it is.” We can’t promise left-side AF sensors will be accurate and can’t check them with any reproducible accuracy since the problem occurs at different distances, focal lengths, whatever. If you decide to use left-side AF-sensor points, your results may be bad, and we can’t be responsible. Boy do we live in some interesting times. For several years, now, Nikon shooters have (admit it, if you’re interested in this camera you have) been a little defensive about the other guys’ higher resolution. Oh, sure, they had better autofocus, and better flash systems, and better high ISO performance. But only the D3x could slug it out pixel-for-pixel on the resolution front. Well, payback is here, and it’s payback in spades. The D800 out-resolves any 35mm camera we’ve ever tested. It’s not close. So if you need to print, oh, say 6 feet by 9 feet, this is the camera for you. Or even if you really just want to capture amazing details you could never see otherwise. How amazing? 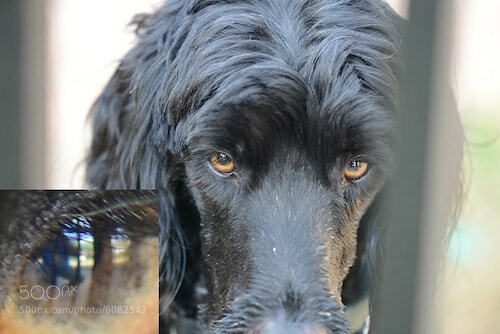 Well, if you take a horrid picture of your dog and blow it up you can not only make out his eyelashes, you can get a nice self portrait or your reflection in his eye — amazing. The resolution isn’t the only improvement, although that in itself would be enough. The LCD, which was charitably described as ‘adequate’ on the D700 should now be described as excellent. You can actually focus live view at maximum magnification now. There are a host of video improvements and the same autofocus updates as the D4 camera. Of course there are some gimmicky things (IMHO) like the DX crop ‘feature.’ But let there be no question: this is the new king of the resolution hill. It’s what this camera is for and what it’s about. All of that being said, I know already that between 25 and 50 people are going to email after using the camera and say their shots didn’t seem much sharper than their old camera. And I’m going to ask to see their pictures. And they’re going to send me shots taken with a nice prime lens at f/1.4. Repeat after me: there is no lens that can do justice to this camera at f/1.4. The best primes can at f/2.0, but most primes will need to be at f/2.8. Even the best zooms will be better at f/4 than f/2.8. If you need to shoot at wide open aperture, save some money and rent a D700. Do any memory cards have compatibility issues with this camera? We strongly recommend using Sandisk memory cards with this camera. Other manufacturers’ memory cards—particularly Kingston CF and SD cards—have known compatibility issues with the D800.